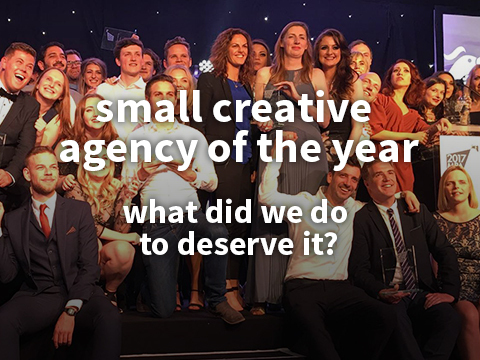 SMALL CREATIVE AGENCY OF THE YEAR What did we do to deserve it? Last night at the MPA awards we gratefully received the trophy with pride. Only a few months ago we recognised after nearly a decade in business, the market may be thinking we aren’t as relevant as we once were. We re-focused, re-structured and repackaged ourselves; taking what we’re passionate about, what we do best & what we believed clients would value most. Split the business into three distinctive areas: Insight, Brand, Activation. Further strengthened existing client relationships, helping them to make more of their data. And maybe more importantly, we achieved what we’ve always set out to do – great work, with amazing clients, having fun and… make a bit of money doing it. IF feels like a start up – a thriving, ambitious and creative business with a distinctive, relevant and compelling client proposition. We promise our team they will do the best work of their lives here and over the last 12 months, we’ve shown that we can deliver. Thanks team IF – carry on like this and who knows, we could be contenders for the MPA BIG Creative Agency of the year before too long.